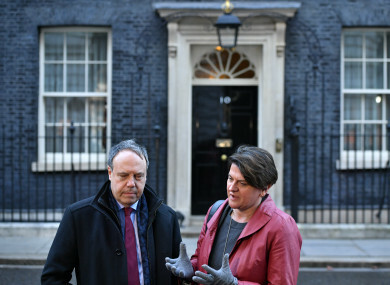 DUP deputy leader Nigel Dodds and DUP Leader Arlene Foster in Downing Street. THE DUP HAS said that it cannot support Prime Minister Theresa May’s latest Brexit deal tonight, making it less likely that the Withdrawal Agreement will pass in the House of Commons. MPs are due to vote once again on the Brexit deal, in the wake of last-minute measures announced last night by May and President of the European Commission Jean-Claude Juncker. However, advice from attorney general Geoffrey Cox published this morning put hopes of the deal passing in doubt. However, the party added that it does want to back an agreement but does not believe May’s deal passes its “fundamental tests” on the “constitutional and economic integrity” of the Union. “The Prime Minister set out a clear objective for legally binding change which would command a majority in the House of Commons in line with the Brady amendment. We recognise that the Prime Minister has made limited progress in her discussions with the European Union. However in our view sufficient progress has not been achieved at this time. “Having carefully considered the published material as well as measuring what has been achieved against our own fundamental tests, namely the impact of the backstop on the constitutional and economic integrity of the Union of the United Kingdom, it is clear that the risks remain that the UK would be unable to lawfully exit the backstop were it to be activated. We want to see a deal which works for every part of the United Kingdom. We will support the right deal which respects the referendum result and Northern Ireland’s place as an integral part of the United Kingdom. The European Research Group (or the ERG), made up of hardline-Tory Brexiteers – has also advised its 110 members not to support the government’s motion, describing the new assurances as offering only “faint and remote prospects of escaping” from the backstop. The House of Commons is due to vote on May’s Withdrawal Agreement at 7pm. There are 650 seats in the House of Commons; Theresa May needs 320 votes to pass her deal tonight. If the deal fails again this evening, parliament will vote on a no-deal Brexit tomorrow, or an extension to Article 50 on Thursday which could delay Brexit if the EU is amenable. Email “It's a 'no': DUP statement means Brexit deal less likely to pass in House of Commons tonight”. Feedback on “It's a 'no': DUP statement means Brexit deal less likely to pass in House of Commons tonight”.